After a thorough assessment, a customized treatment plan is developed for each patient. Treatment is covered by most insurance plans. Enrollment at our clinic is by physician referral only. Hours: Monday – Friday, 7:30 a.m. - 3:30 p.m.
Hyperbaric oxygen therapy involves breathing pure oxygen in a pressurized room. It is used to treat serious infections, bubbles of air in the blood vessels, and wounds that will not heal as a result of diabetes or radiation injury. 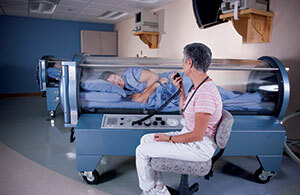 Hyperbaric oxygen therapy is covered by insurance. We follow all guidelines set forth by insurance carriers and treat only those indications set by the Undersea Hyperbaric Medical Society.